There aren’t any monumental changes to the RMX since its near first release in 2010, when an emissions snafu arose that ultimately kept it off American soil literally days after it was introduced. The RMX, however, returns for round two like it was seven years ago but with a few changes, like getting black Excel rims and black side panels, and an updated headlight. And—here this is the real biggie—no longer can the consumer simply change or modify the Green Sticker-compliant mapping (which, if you could, of course, would immediately render it a closed-course race bike and would no long qualify as a Green Sticker motorcycle). 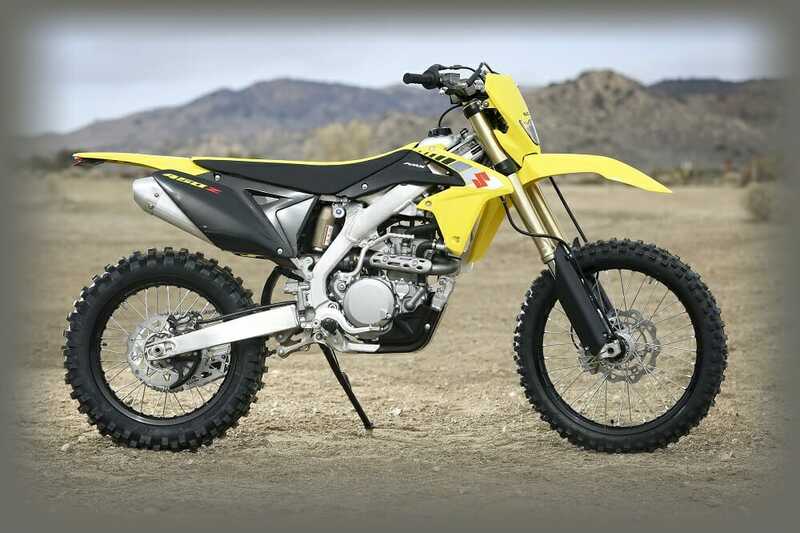 Other than those small updates, this is the same off-road dirt bike Suzuki almost sold in the U.S. in 2010. 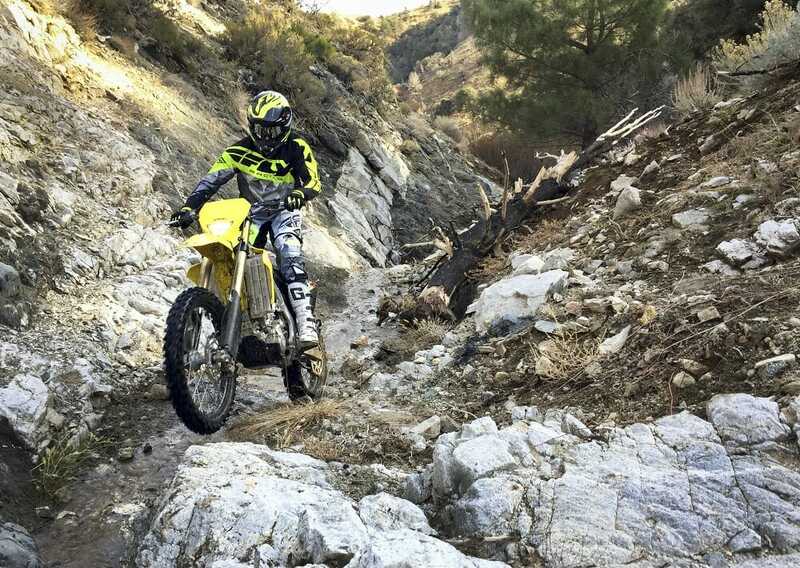 Suzuki gets serious about off-roading again with the re-introduction of the RMX450Z. 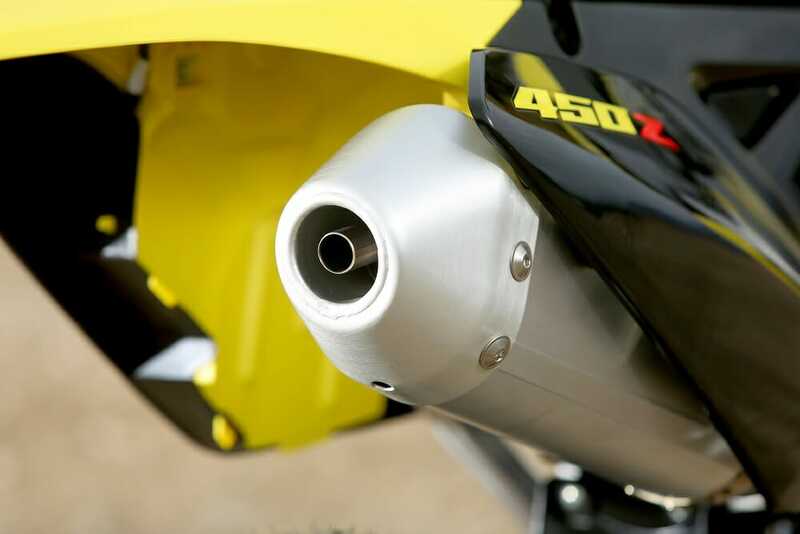 Tucked inside what is essentially the 2009 RM-Z450 chassis is the off-road-tweaked RMX450Z engine. The 2017 Suzuki RMX450Z powerplant is very similar to the 2017 RM-Z450 (and the 2010 RM-Z450 for that matter) except the RMX has a different inlet tract and different camshafts—both engineered to improve low-to-mid power for off-road-type riding. The RMX also has lower compression at 11.6:1 compared to the RM-Z450 at 12.5:1. To make room for the electric starter motor, the cam-chain tensioner is located on the cylinder head instead of the cylinder. 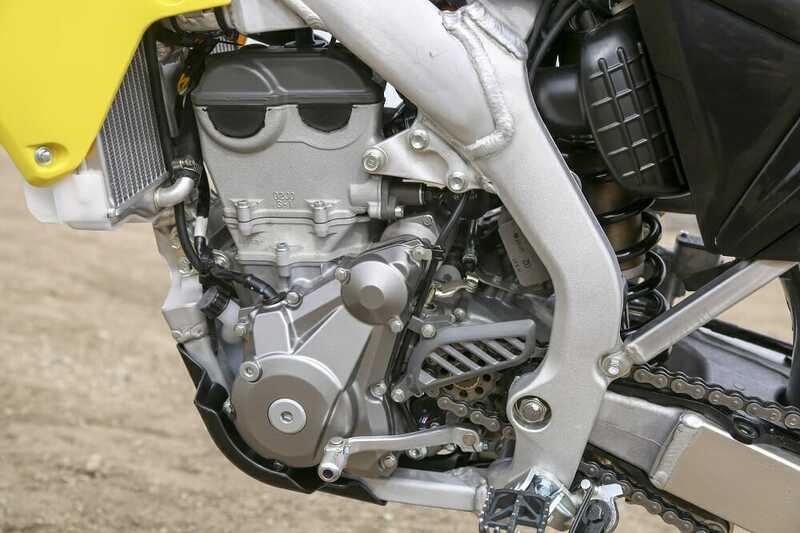 The RMX cylinder and head, by the way, are not interchangeable with the RM-Z. Feeding the RMX is a 41mm Keihin throttle body; the RM-Z uses a 43mm unit. First and second gears are lower on the RMX when compared to the RM-Z; third gear, however, is very similar. 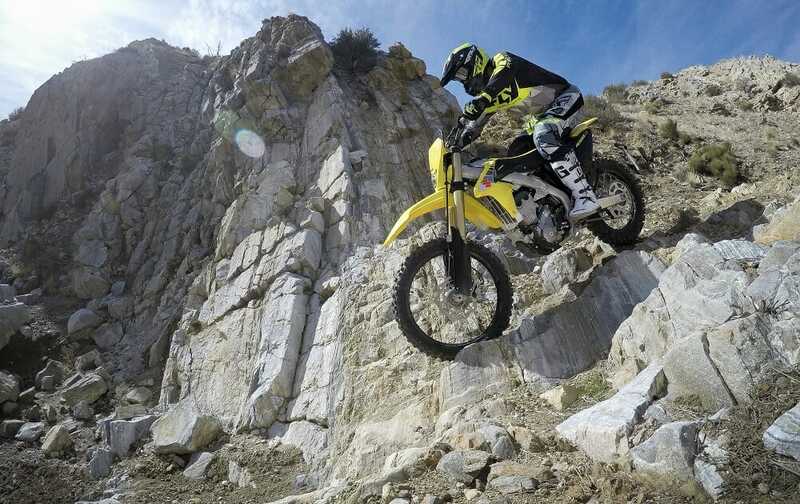 With only five speeds, fourth and fifth are taller on the RMX than the RM-Z. The RMX’s Showa suspension came right off the 2010 RM-Z450, using a similar fully adjustable shock and 47mm cartridge coil spring fork. You won’t find the air fork of the current motocross bike on the RMX. 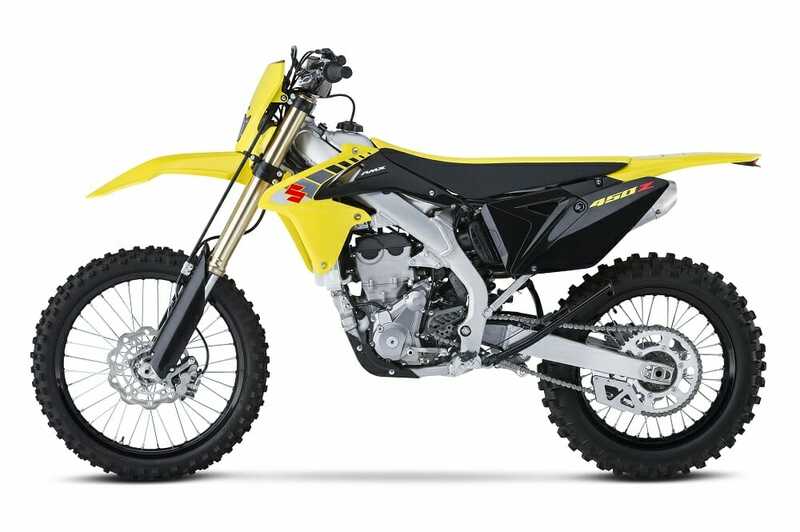 Helping transform the RM-Z450 into an off-road machine is an 18-inch rear wheel, and the addition of a sidestand, a 35-watt headlight and LED tail light, and an easy access air filter. It also has a digital computer/speedo unit that, besides having “standard mode” also has a “sport mode,” that includes timer, average speed and tripmeter functions—good for old-school enduros (if you can still find them anymore). This is basically the same bike that Suzuki tried to put on the market seven years ago. An emissions snafu prevented that from happening. Because the RMX is sold as a California Green Sticker-legal machine, it comes stock with a throttle stop installed, a very quiet exhaust system with a spark-arrestor muffler, emissions-compliant fuel mapping and a tight air box. California Green Sticker-compliant vehicles are subjected to evaporative, exhaust- and sound-emission requirements by the EPA and face more stringent regulations than red-sticker bikes. In neutral, the 2017 RMX450Z fires up easily (something that the ’10 model did not do so easily) and idles smoothly when warmed up. The lean EFI settings require the engine to be warmed up to temperature to run best. The stock throttle stop gives you about a quarter throttle of use. We rode it like this for about five minutes before removing it to see what full throttle was like. We didn’t mess with the air box (more specifically remove the restrictive air inlet snorkel) or the exhaust (removing the sound reducer from the muffler) as doing so would make the already lean mapping way too lean, because the tamper-proof ECM (Engine Control Module) will not automatically (or manually) compensate for these changes, resulting in poor performance or, even worse, possible engine damage from the overly lean conditions. Basically, it’s all or nothing when it comes to modifying the RMX’s engine; we chose nothing, wanting to keep it EPA friendly and Green Sticker legal. We’re not ready to jump into turning this into a full-blown, closed-close-only race bike just yet. 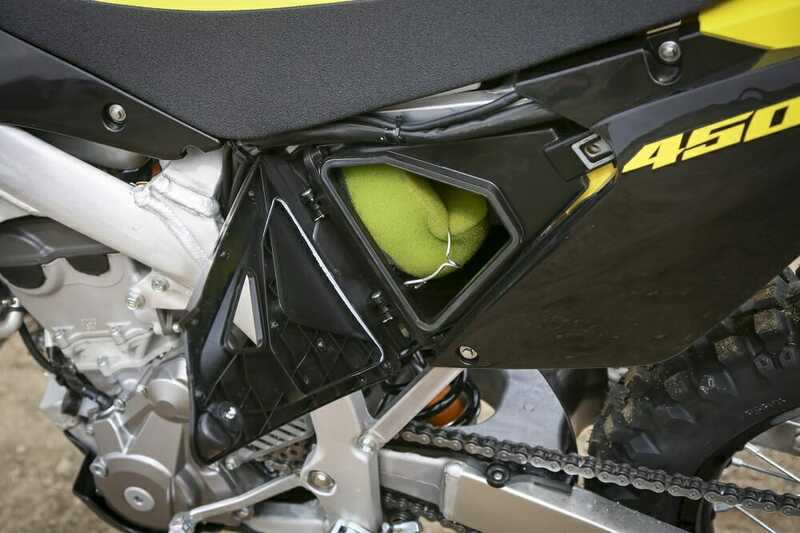 The air box allows easy access to the air filter. With just the throttle stop removed, the RMX450Z is very rideable and delivers smooth power while doing so very quietly. Surprisingly, it puts out decent power considering how restrictive the air box and exhaust seem. It doesn’t showcase aggressive or very snappy power, but it will climb some big hills when in the higher rpms. This is a detuned motocross engine geared toward off-road riding, but its heart beats best when opened up. Here, the lean fuel mixture seems to be a lesser issue and the bike runs pretty well. While the power delivery is good, and very smooth and friendly off idle, it does suffer from pop stalling, or “flaming out,” often. This was also an issue we had with the 2010 model. The restrictive muffler muffles more than just sound. Unfortunately, the RMX still tends to flame out at the worst possible time, every time. Every single test rider we had on the bike stalled more than once, usually resulting in a tip over or a dropped bike. The frustrating part of the flame out is that it isn’t totally consistent and often happens at different rpm under different load situations. Narrow and nimble is the RMX450Z’s mantra. In classic Suzuki RM-Z form, the RMX corners easily and precisely. With the added weight of electric-starting parts, headlight, side stand and an 18-inch rear wheel, the RMX is heavy on the scale (272 pounds we are told) but doesn’t feel too bad out on the trail. A little more pep in the power department would help make the RMX feel lighter, but the small and narrow gas tank contributes to a slim motocross feel, which is a good thing for sure. There is no mistaking the RMX’s electric-starter motor. When you think of a Green Sticker-legal bike you envision a bike ready to take on some rough and technical, maybe even slower-speed, trails. This is not exactly what the chassis and suspension set up of the RMX450Z is all about. Mix the flame out tendencies with suspension that doesn’t shine in rocky and rooted trails and you have a bike that really wants to be a race bike, but is stuck in Green Sticker legality limits. As is, it really prefers more open spaces and higher speeds to get the suspension moving through the stroke, liking to be ridden between 20-40 mph. With momentum, front-end deflection isn’t as bad and the engine rpms are generally above the flame-out zone. Heavier riders (200-plus pounds) found the RMX more plush and compliant on technical trails while those under 200 pounds had to take out a lot of compression to feel any sign of plushness. The 2017 RMX450Z has close ties with the 2009 RM-Z450 motocrosser, a very good bike still to this day. The 2017 RMX450Z is still faced with another issue—the small 1.6-gallon gas tank; it’s the same as the RM-Z450’s. On average, after only 30 miles of riding, the low-fuel light starts to glow, letting you know you are dangerously low on fuel. It runs dry anywhere from 35-45 miles depending how aggressively you’re riding the bike. That’s not far for an off-road motorcycle. The RMX comes fitted with Dunlop tires that Dunlop hasn’t sold to the public in about five years—the 18-inch 756 (rear) and 742FA (front). Dunlop does sell the specialty D756 EX rear tire, but it’s designed specifically for EnduroCross. Luckily, the stock RMX tires are still pretty good all-around performers. The unfortunate conclusion, however, is that the RMX450Z is not especially enduro savvy right out of the crate, which is how we wanted to ride it for this test. Power doesn’t get your adrenaline flowing and the flame-out issue is annoying, to say the least, so slow-going technical trails are not our favorite on the RMX. 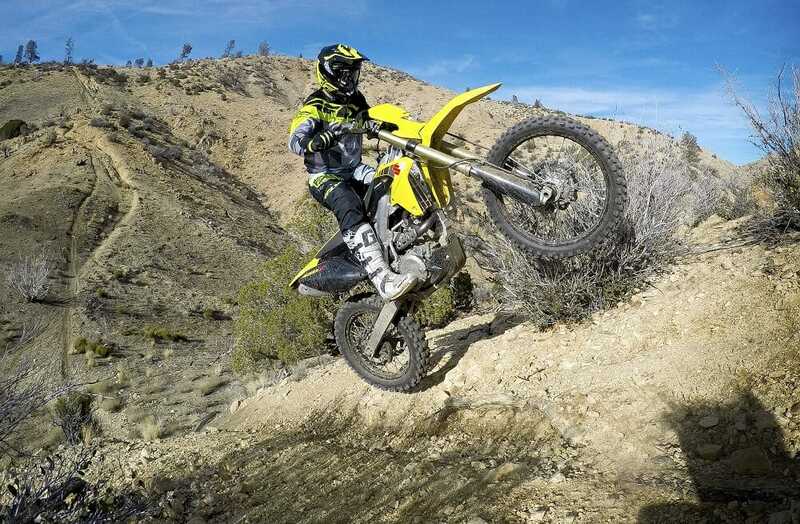 Instead, the RMX is more at home over faster terrain where the stiffer suspension can soak up bigger hits and the stock lean fueling can work better, like during a race, which, by the way, Suzuki wants you to do on it and is giving you an incentive. The RMX is eligible in Suzuki’s racing-contingency program. Spring forks handle suspension duties up front. On the plus side, the RMX is, of course, Green Sticker-legal, making it a workable option for riders in California who ride in areas that require a Green Sticker all year. For more Suzuki motorcycle reviews, click HERE. 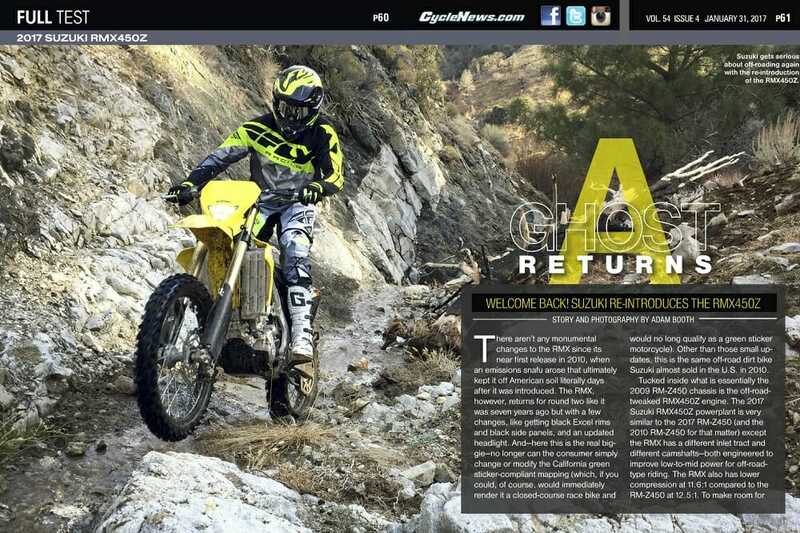 For more Cycle News Off-Road motorcycle reviews, click HERE.